A Cataract is a clouding of the normally transparent lens within your eye. 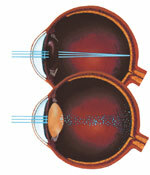 The lens is located directly behind the pupil and normally assists in focusing light for clear vision. As the cataract worsens, it prevents light from coming through your pupil and focusing clearly on the retina. Early changes may be very minor, but as this process continues, symptoms of blurred vision, light sensitivity, glare, and night driving difficulties increase. There are several types of cataract. The major two are "nuclear" and "posterior subcapsular." A "nuclear" cataract involves the center (nucleus) of the lens and usually comes on quite slowly over a prolonged period of time. This is the "usual" form of age-related cataract. Approximately half of all Americans age 65 to 74 have cataracts and 70% of those age 75 and over have this condition. The posterior subcapsular cataract (PSC) is more commonly associated with other conditions such as eye injury/trauma, diabetes, and certain types of medications (steroid use, etc.). The PSC cataract may develop quickly in that it only occupies the very back surface of the lens. It need not grow throughout the lens. Symptoms of glare and reading difficulty are usually more pronounced early on with PSC. Problems with night driving caused by headlights and glare. Problems with daytime glare and sun glare. Difficulty with reading, requiring brighter than usual light to see clearly. Changes in the way you perceive colors. Initially, changing your glasses, stronger bifocals, and tinting your glasses may help improve your vision. However, once the cataract progresses, surgery is the only option for return of clear vision. One should consider cataract surgery when the cataract appears to be interfering with your usual daily activities. Once you perceive difficulty with driving, reading, and other every day activities, cataract surgery can be quite beneficial in returning your previously good vision. Cataract surgery is one of the most successful procedures in all of modern medicine, so don't allow your vision to limit your independence. Modern, state-of-the-art cataract surgery takes only 10 minutes. Dr. Hasty performs these surgeries as an outpatient procedure at the Northwest Florida Surgery Center where highly trained staff and excellent equipment make this a safe and comfortable procedure. Only eyedrops are used to numb your eye (no shots are required for this procedure). After receiving eyedrops for 15 to 20 minutes prior to the surgery, you are taken to an operating room where your eye is cleaned and covered with sterile drapes. You are completely awake for the surgery, although you can receive a mild sedative if you are anxious. A tiny 1/10-inch incision is made through which the cataract is removed by phacoemulsification and a soft foldable lens implant inserted in your eye behind your pupil. This surgery causes little or no discomfort, requires no sutures, and also no patch is needed at the end of the procedure. Once the surgery has been completed, you sit in a chair for a few minutes in the recovery area and have a cup of coffee or juice. You are given photographs that were taken during the surgery for you to keep. Dr. Hasty personally answers all of your questions after surgery, and then you are provided with drops to use for a few weeks after the surgery. Once the drops are completed, any final glasses that you may need are prescribed a few weeks after the surgery. Cataract surgery has a very high success rate (over 98%) of returning your vision back to its previously good state. 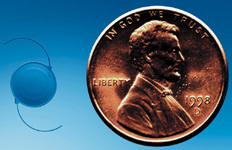 Various soft, foldable lens implants are available to replace the cataract lens that has been removed at the time of surgery. The size, the shape, and positioning of this lens implant are quite critical for optimal vision after the cataract procedure. Preoperative evaluations measure the size of your eye in length, width, and curvature. Formulas are used to calculate which lens will optimally suit your specific eye. All modern cataract lens implants used by Dr. Hasty have ultraviolet filters built into the lens implant to further protect your eye. The ArrayTM lens implant by AMO has a unique, progressive bifocal design to allow correction of both your distance and near vision after cataract surgery. This lens works quite well in most individuals, however, if your pupil is particularly small, you may have excellent distance vision but not benefit so much on your near vision. If your pupil is particularly large, you may notice halos around lights at night. These considerations are discussed thoroughly with each individual as part of the preoperative evaluation so that we can choose the lens which best suits your individual needs. If you are experiencing symptoms of decreased vision related to cataracts and they are affecting your ability to enjoy your favorite every day activities, you should come in for an evaluation and consider cataract surgery. In addition to being a Board Certified Ophthalmologist, Dr. Ben Hasty has also been certified as a specialist in cataract and lens implant surgery by the American Board of Eye Surgery. 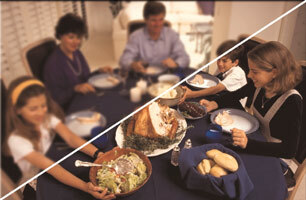 Please call Advanced Eye Care at 850-784-3936 or 800-590-5500 for a full cataract evaluation. Lights seem too bright or have a â€œhaloâ€ effect. Decreased night vision â€“ sensitivity to glare from headlights.